Our nature has different ways of providing us with benefits. One of the ways is with foods that we eat. While there are many vegetables and fruits that serve us many purposes, today we bring to you the one who might taste bitter but is endowed with goodness, methi or fenugreek. Belonging to the family Fabaceae, fenugreek goes by the botanical name Trigonella foenum-graecum. From its seeds to its leaves, there are many fenugreek benefits that can help us to keep up with many health concerns. 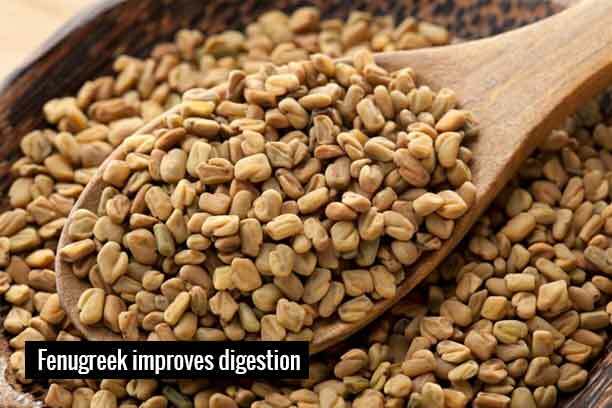 The most common fenugreek benefits include its ability to lower cholesterol, improve symptoms of diabetes as well as help in weight management. So are you ready to find the surprising benefits of fenugreek that will compel you to include them in your favourite list? Fenugreek or methi is cultivated widely across the world. It is particularly very popular in India. The numerous health benefits of fenugreek are due to its high nutrition facts. It consists of various nutrients such as vitamin B6, protein, fiber, iron, copper. Its high fiber quality makes it very useful for weight loss. You can try Truweight’s Tru Fiber with the goodness of fenugreek besides having Psyllium husk and basil seeds. Due to the presence of the natural soluble fibre galactomannan, methi provides a protection to the heart from heart attacks. Moreover, fenugreek is found to reduce platelet aggregation ( a condition where the blood platelets clump together) that in turn, reduces abnormal blood clotting that can lead to heart strokes. Methi benefits the heart also by reducing the bad cholesterol in the blood as well as prevents atherosclerosis (building up of fat and cholesterol in the arterial walls) which lower heart problems further. Also, fenugreek seeds are good sources of electrolyte potassium that balance the sodium level, keeping the heart rate controlled. To be noted: Study showed that taking 2 oz. 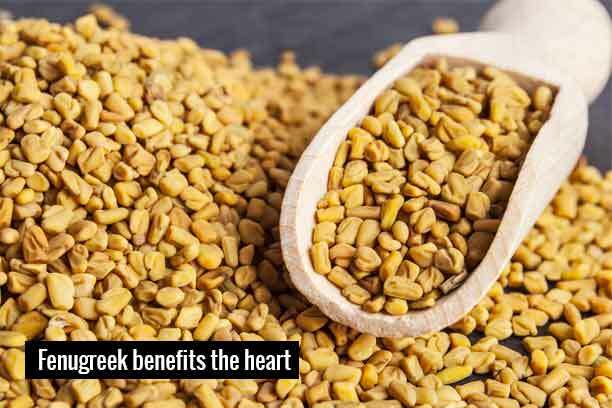 of Fenugreek seed daily over six months reduced risk of heart attack by 25%. Having methi for cholesterol is very popular. 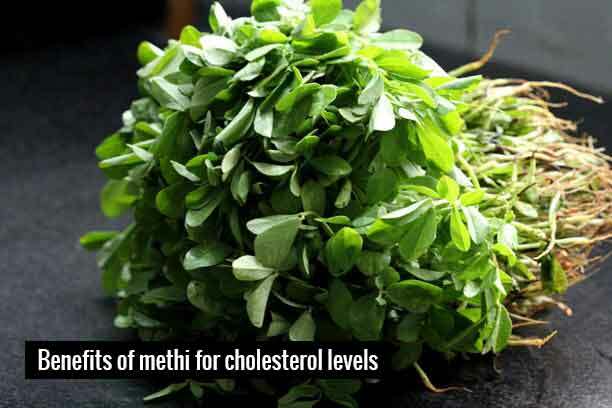 Methi prevents the absorption of cholesterol in the intestine. It also helps in lowering the cholesterol levels. It reduces the cholesterol levels, LDL and triglycerides while increasing the HDL levels. Methi consists of a component called steroidal saponins that prevent the absorption of cholesterol and triglycerides. Moreover, fenugreek contains high fibre content that lowers the hepatic synthesis of cholesterol. To be noted: Study show 2 oz. of Fenugreek seed daily over six months lowered cholesterol levels by 14%. The richness of fibre and antioxidants, make methi amazing for the digestive system. The seeds containing fibre and pectin are found to improve stool volume. This makes methi very helpful during constipation. These seeds also improve bowel movements and rectify heart burns too. Therefore keeping some methi seeds in the kitchen can be very helpful. To be noted: You can have a cup of warm water with fenugreek powder for constipation. Methi or fenugreek seeds contain amino acids that are found to improve secretion of insulin in the pancreas. This results in lowering of blood sugar level. Moreover, the galactomannan delays the carbohydrates and sugar absorption into the blood. 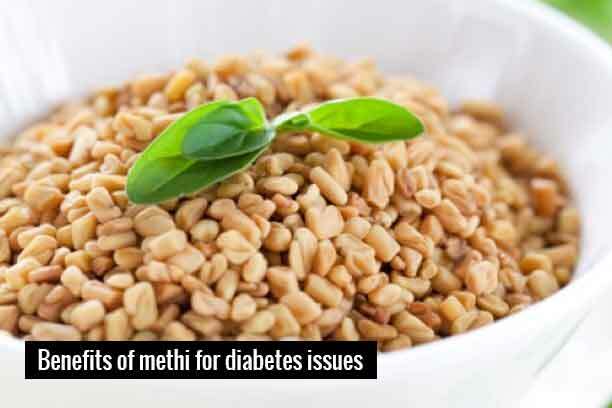 Also, studies and tests have shown that methi seeds improve certain symptoms of type 1 and type 2 diabetes. That is why consuming methi for diabetes is considered very effective. To be noted: Researchers in India found that adding 100 grams of defatted fenugreek seed powder to the daily diet of patients with insulin-dependent (type 1) diabetes significantly reduced their fasting blood glucose levels, improved glucose tolerance and also lowered total cholesterol, LDL or ‘bad’ cholesterol and triglycerides. There are a number of women health benefits that can be derived from methi. One of them is that methi helps to reduce menstrual issues like cramps. Its compounds diosgenin, as well as isoflavones, also help in combating menopausal issues, even mood fluctuations. So, including methi in your food can bring to you some relief about menstruation. The compound diosgenin in methi is known to enhance lactation. Moreover, this compound also helps in improving the mother’s milk quality that is beneficial for the baby. 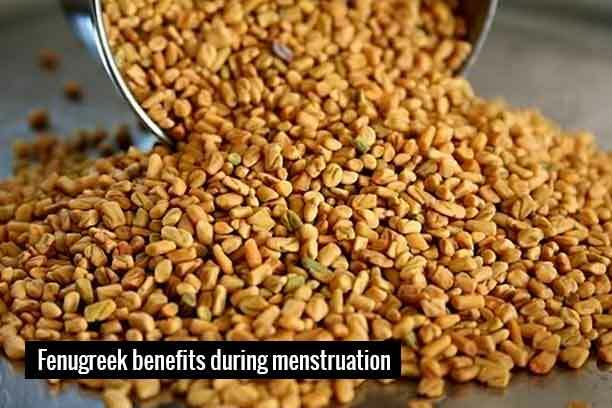 Like in women, fenugreek or methi can be beneficial for men too. Methi consumption can increase sexual drive or libido in men. Also, methi is found to be improving athletic performance in men too. It contains the enzymes- aromatase and 5α-reductase. These enzymes are found to be effective on men’s hormonal profiles, strength, body composition etc. It can also help in treating many sexual issues in men like erectile dysfunction, impotency etc. Moreover, it is also known to be helpful in increasing the testosterone hormone level in men. To be noted: In a Phytotherapy Research, 60 men between the ages of 25 and 52 years with no history of erectile dysfunction were supplemented with either a placebo or 600 milligrams of fenugreek extract per day for six weeks. The results with fenugreek consumption were such that the men showed significant influence on sexual arousal, energy and stamina along with a proper testosterone level. Massaging of the scalp with methi powder and coconut oil can avoid hair’s turning grey prematurely. Fenugreek or methi leaves can be used as a face pack for preventing pimples. If you are a coffee fan, you’d be happy to know that roasted methi seeds are used as a substitute for coffee. Methi leaves are dried and used as insect repellants. It is also known as Greek hay. Methi seeds and leaves are used for the treatment of anaemia because of its richness in iron. Some of the benefits of methi water are aiding digestion, having anti-inflammatory properties as well as dissolving kidney stones etc. Skin moisturizing, curing acne, anti-aging properties are some of the methi seeds benefits that make them one of the prime ingredients for many cosmetic companies. 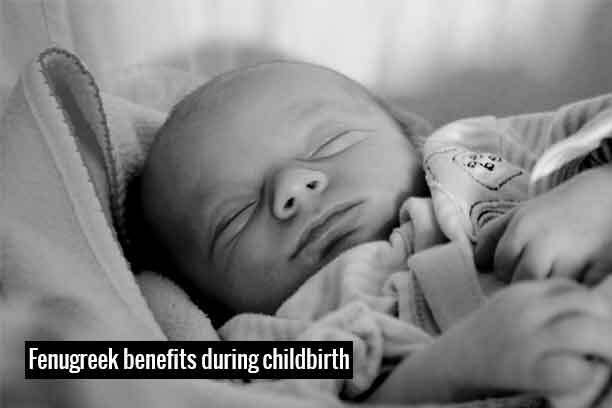 Another benefit of fenugreek for women is that it helps in inducing childbirth. Methi induces uterine contractions during childbirth and also reduces the discomfort of labour pain. To be noted: Excessive consumption of methi during pregnancy can lead to miscarriages. So, if you are taking methi while being pregnant, make sure you are taking in the right amount. One of the many benefits of methi seeds is their property that helps in weight loss. The compound galactomannan gives a fullness when consumed. Moreover, methi contains soluble fibres which further enhances the feeling of fullness making you less hungry and hence eat less. Also, methi seeds contain very less carbohydrate content and the high fibre content besides giving fullness feeling increases the body’s metabolic rate. This is known to boost fat burning. Moreover, the increase of insulin absorption supports less storage of body fat which in turn promotes weight management. To be noted: In the study of “European Journal of Clinical Pharmacology” in May 2010, it was found that overweight people who took fenugreek seed extract for six weeks ate less fat than those who were given a placebo. a) Soaking methi seeds overnight in warm water. In the morning chew on the wet seeds. Grind methi seeds and prepare a paste with water. Boil water and add the paste. You can add cinnamon for taste. Boil the water and cook the tea. For best results, have methi tea on an empty stomach. Some of our Truweight products that use the goodness of methi are Trufibre that also contains Psyllium Husk, Fennel Powder, Cinnamon Powder etc. The other product is Truweight’s Diet Khakra- Methi Masala, which can be a healthy replacement of unhealthy junks. 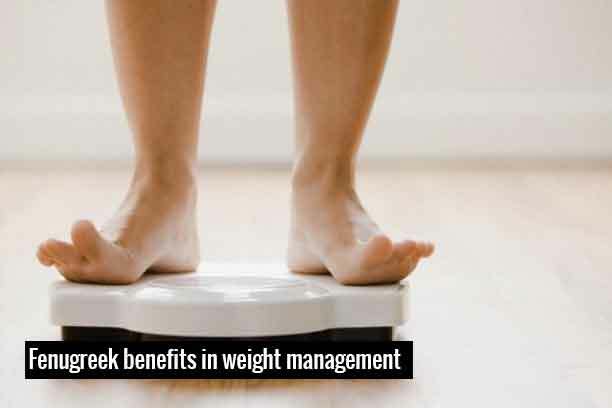 To know more about our foods and diet plans for weight loss you can always consult a Truweight Nutritionist right away. Click here to avail a consultation for FREE!